AXION STRUCTURAL INNOVATIONS (www.axionsi.com) manufacturer of Engineered Composite Cross Ties. Made from 100% recycled plastic. NO Toxic Preservatives. Impervious to moisture & rot. Non Corrosive & Recyclable. Does not conduct electricity. Long lasting 50 years>. Tested at the TTCI of the AAR in Pueblo, Co. On elevated track on the CTA, Chicago. Crossties on Washington’s MTA. Installed under Special trackwork on Toronto’s TTC Subway. Tested on the BNSF, UP, & others. Standard tie installation methods. 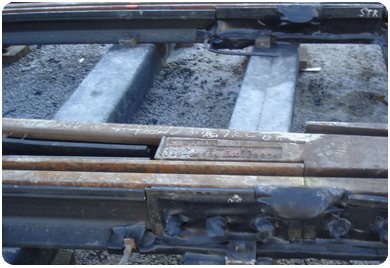 AXION ECOTRAX® Composite Ties being installed under a road crossing in Calgary 2010. 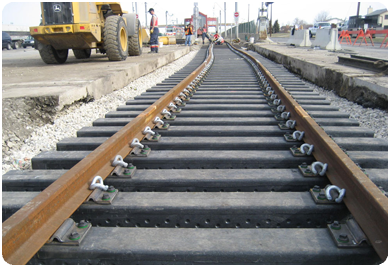 AXION ECOTRAX® Composite installed under special trackwork on Toronto's TTC Streetcar line in March 2009.